After bringing your new parrot home, give it a few days to get use to its new home before you attempt to hold it. Start offering it foods from your fingers. Do not play tug-o-war with food. It he grabs the food and pulls, let him have it. Do not insist on holding the food while he eats it. You are just going to make him angry. By offering his favorite foods and treats by hand, he will soon look forward to you coming. Talk softly and the while and gently try to pet him. Okay, you just got bit and you are scared of him. Now what? You won't like hearing this but you have to keep trying and don't pull your hand away when he bites. 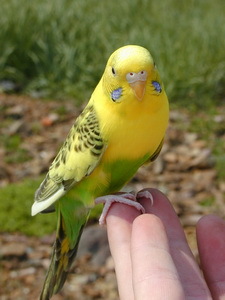 The same principal is used on parrots. If you pull your hand away and yell, then they got a reaction out of you and will try again to get the same reaction. I know you do not think it is funny but they do. Do not put them back in the cage. You are rewarding them for biting you. Here is a trick that has worked with a few parrots. Put some yogurt, honey or something sweet on your fingers. Hopefully when he goes to bite he will taste the food and start licking your fingers instead. Eventually he will see that your fingers mean him no harm. Some people put on a shirt over top of a shirt and place the Sugar Glider between the two shirts and walk around the house for a while, repeating this each day. This helps to get your sugar glider use to your scent and oh yes, get you use to his scent. Un-neutered males like to mark their territory by urinating on it(you). Oh, come on, it's not that bad as I am constantly telling my son. They don't go that much. Just ware old shirts. Sugar Gliders do like to nip and bite as they are bonding with you. Remember, don't react and pull your hand away. You can also try to distract them. Get a buzzer, bell, alarm or whatever else you can come up with. Have this in your other hand out of sight. When your sugar glider goes to bite, make the loud sound. Hopefully this will take him off guard enough to forget about biting you. The key is to distract him, not frighten him to death so make sure the sound isn't ear piercing. Keep in mind that Sugar Gliders are scent animals which means they recognize you by your scent. If you have on perfumes, scented lotion or anything that covers up your natural scent, your Glider might not recognize you which could cause you to get bit. You might try rubbing your Gliders pouch on your hands and arms or rub your hands and arms over his cage before holding him to help cover up any perfume type scents that might be on you. I can't promise this will work for you but it has worked for me.